For several years, the IRS has treated mobile phone expenses for businesses and employees as part of a category of business assets called listed property. This category of assets includes possessions that may be used for both personal and business purposes. For these, the IRS requires more detailed record keeping in order to separate personal use from business use. A provision of the Small Business Jobs Act of 2010 removed cellphones from the category of listed property. That is, the device itself, not the costs of using it, was excluded from the list. Although the IRS removed mobile phones from the listed property category, it did not remove mobile phone costs from the category of fringe benefits. It makes sense. Most businesses these days require employees who travel or are in management positions to have mobile phones. The IRS also says that "when an employer provides an employee with a cellphone primarily for...business reasons, the business and personal use of the cell phone is generally nontaxable to the employee. The IRS will not require record keeping of business use in order to receive this tax-free treatment." The IRS calls a mobile phone a "working condition fringe benefit." That benefit is defined as "any property or services provided to an employee of the employer to the extent that, if the employee paid for such property or services, such payment would be allowable as a deduction." As such, it is considered an ordinary and necessary business expense. 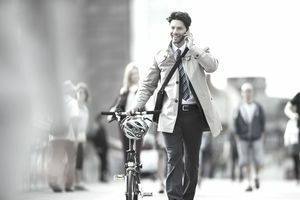 As a working condition fringe benefit, employee personal use doesn't affect the ability of the business to deduct business-related mobile phone costs, nor is it taxable to the employee as a fringe benefit. Essentially, this means that the primary business purpose must be established in order for the business-related expenses to be deductible to the business while avoiding forcing the employee to pay taxes for the use of that phone. The nonbusiness personal use of the cellphone is not deductible as a business expense of the company. If you require employees to use mobile phones for business purposes, the employee's personal use is treated for tax purposes as a de minimus fringe benefit. This IRS provision applies to use of an employer-provided mobile phone. What is "ordinary and necessary" is determined by the IRS and applies to mobile phones in specific ways. An example used by the IRS to describe "business purposes" is an employer requirement that the employee must be reachable by phone during non-business hours. On the other hand, the IRS says providing a mobile phone for morale or goodwill purposes, to attract a new employee, or as a bonus are not considered "business purposes" and do not exclude the phone from being a fringe benefit. Taking cellphones out of the listed property category does not mean you can forget about keeping good records on the personal use of your mobile phone. You still must be able to prove that the phone was used primarily for business purposes. Restrict mobile phones to employees who must have them to properly perform their duties, such as outside sales representatives, managers who travel frequently, and executives. Keep employee phone logs to verify business usage. If this is onerous, find a way to access online cellphone logs through your carrier so you can retrieve them if necessary. Require that employees with company-provided mobile phones keep another phone for personal use.